Daily Quickie will be a short tag on the title which I'll use for blog entries about food I'm snacking at home, work or anywhere. It's a norm in our family to order from Pizza Hut whenever our parents wouldn't be around. So yesterday when our mom left us with merienda money, we automatically logged on to Pizza Hut's online ordering website and chanced upon their Tuscani selection, Pizza Hut's new line of pizzas endorsed by the Philippine's pride, Shamcey Supsup. 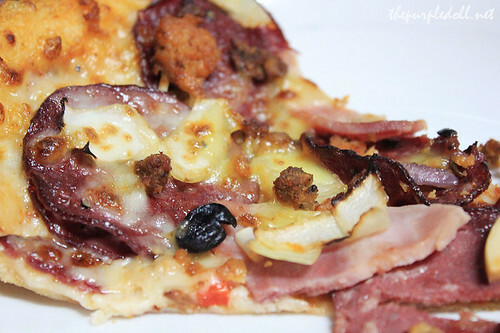 We ordered the Tuscani Supremo (P549) along with a bottle of Pepsi to avail of the free Hawaiian Pizza. Despite Pizza Hut being known for their thick crust, their Tuscani line has a thinner crust and is bigger than the standard family size. I actually love this pizza more than their Super Supreme which our family always order. Later in the evening, a family friend dropped by and brought us 2 whole roasted chicken from S&R. I took a photo of the roasted chicken itself but didn't bother to post it. Whole roasted chicken for takeaways do not look good on photo. Although I'm not really a fan of roasted chicken, I must say that this one is really tasty! 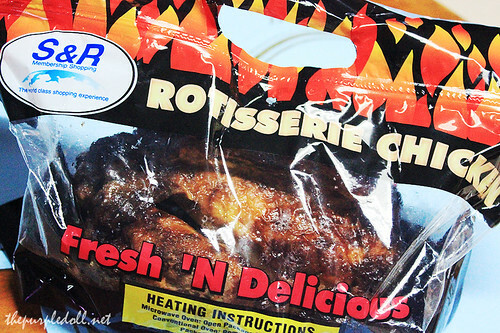 The plastic bag doesn't only contain the roasted chicken, but also some of the chicken's oil or probably its marinade. This gives the already-moist chicken meat more flavor. How about you? What have you been eating at home recently? Share it on the comments below. Anyway, have a safe and great day. i haven't tried ordering pizza online. i've tried sms but it is not working so i always call pizza hut. @michi: Their online ordering system is quite good. They'd have to call or email you for order confirmation though. @laarni: Thanks for following back sis! Anyway, you should definitely try this. It's actually at par with Yellowcab's pizzas. Hi! I am back just to tell you that I have something for you in my blog. Please visit the link below. 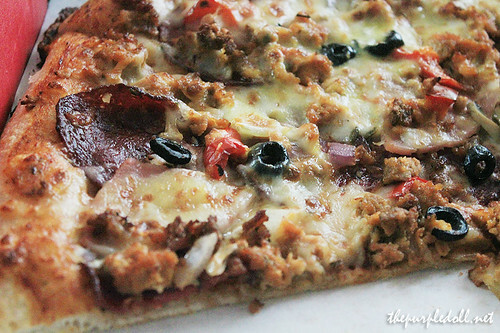 super meaty ang pizza...drooling! I prefer litson manok na luto from uling...ehehhe...uso kasi ang rotisseri chicken dito, kaya pag miss ko ang litson manok yan nalang binibili ko...enjoy your weekend!